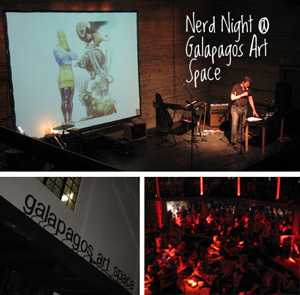 Hey nerds, check out Nerd Night at Galapagos where single smarties can go speed dating, as well as see presentations about manipulating people’s perceptions on physical attractiveness, a virginity primer, and Thomas Paine (the heart of America’s birth), plus juggling. RICE not surprisingly offers a pretty intense variety of rice, from brown to Bhutanese red. Most of the rice based dishes come in large and small sizes. Right below RICE is Low Bar, an extremely convenient place to grab a drink and catch some great DJs spin in a lounge environment. Right off the water, with a view of the South Street Seaport and the Brooklyn Bridge so close you can touch it, the only thing that could make this view better is ice cream. You’ll usually find a long line for Brooklyn Ice Cream Factory, but the sweet flavors are worth it! Bill Laswell, one of music’s most experimental and well regarded bassists today meets one of music’s legendary saxophone improvisers around in John Zorn, which should make for an explosive night of music. A favorite restaurant of mine, Supper has a dimly lit, all-wood interior giving it a rustic vibe. They even have what looks like a bar overlooking the chefs cooking for you to watch. The Italian menu offers some fantastic food too. Though it might sound like it has to do with Buddhism, Barramundi is actually an Australian owned bar that has infused vodkas, sangria, and a laundry list of mixed drinks like the Champagne Cocktail made with sugar and bitters with Courvoisier, topped with bubbly. If coffee and a snack is your thing, Kudos is an inexpensive place to get baked goods, a cup of coffee and chill before the show. Celebrating the release of their new album, indie-rockers from Brooklyn The Forms play songs off their new EP Derealization. 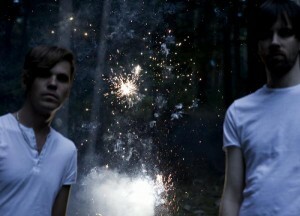 Joining them are the awesome Brooklyn band Monogold. For great Kansas City style BBQ, check out Jake’s Barbecue Restaurant where the use of dry rubs, sauce, and slow cooking make for some mouthwatering food. Try the Pulled Pork Platter ($14.50), the Half BBQ Chicken ($12.95) or any number of combinations. A former Italian Social Club, Brooklyn Social still has that old 1930s charm and a great drink menu with mixed drinks falling in the $8 range. As much of a fan I am of Dunkin Donuts coffee, I say skip it and try The Coffee Den. They have a nice selection of coffees from dark to light roasts and even have Gorilla Coffee, one of the best and darkest in the city. In Gruesome Playground Injuries over the course of 30 years, the lives of Kayleen (Jennifer Carpenter) and Doug (Pablo Schreiber) intersect at the most bizarre intervals, leading the two childhood friends to compare scars and the physical calamities that keep drawing them together. Arguably one of the top bread makers on the east coast, and good to get gourmet pizza’s and sandwiches, Sullivan Street Bakery makes exquisite food using ingredients you’d see on the Food Network! More bar than grill, Rudy’s Bar & Grill is like going back to college, minus the books. The beer is cheap and by “grill,” they mean free popcorn and hot dogs. If you have trouble finding the bar, just look for the 6 foot tall fiberglass pig standing outside! To get out of the cold and see what an upper-class mall is like, stop by The Shops at Columbus Circle. Expensive restaurants like MASA and shops like Williams Sonoma are fun to browse through to see how the other half lives. 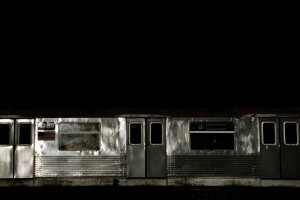 In the exhibition Dark Day, photographer David S. Allee captures his NYC landscapes during the day, but uses tiny apertures and the fastest shutter speeds available to capture the sun’s reflection while letting as little light into the camera as possible, getting underexposed and dark images. The owner of GoGo Curry is obsessed with the Yankees Hideki Matsui and his Jersey (55). The menu’s theme is baseball and katsu, a fried meat, chicken, or shrimp cutlet served in a curry sauce is the specialty here. Portion sizes are Walk (small), Single (Med. ), Double (L), and Triple (XL) and are inexpensive. The mascot, a gorilla for some reason, is plastered everywhere, making this place even quirkier. In the heart of the garment district, Stitch, a cozy after-work bar/lounge, stocks a cocktail menu with a design theme. If you still have energy and are in the mood to bowl, check out Leisure Time Bowl. Located in the Port Authority, this place is stylish and fun.